Finishing the day off with pompano put icing on the cupcake for many of Guide Tommy Pellegrin’s March trips. For most Louisiana coastal anglers, pompano are considered a savory, delectable by-catch when targeting speckled trout — which is actually a pretty good problem to have when you think about it. Capt. Tommy Pellegrin of Custom Charters out of Houma said March and April are prime months to put some pompano on ice. Pompano belong to the large jack family, with almost 30 members swimming in the waters of the Atlantic Ocean and Gulf of Mexico. 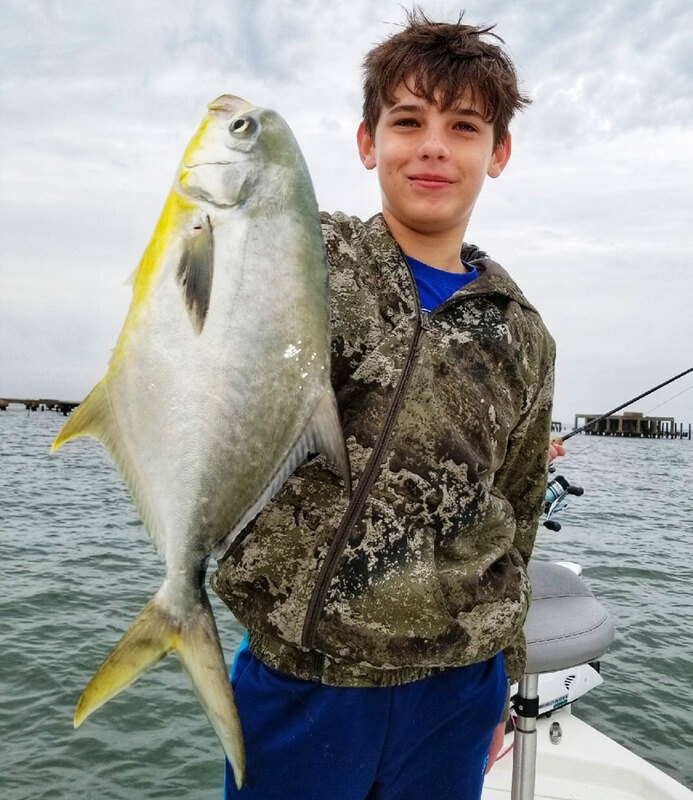 They range from the Atlantic bumper to the greater amberjack, and from jack crevalle to the Florida pompano, simply called pompano here in Louisiana. Jack Gibson from Ocean Springs, Miss. 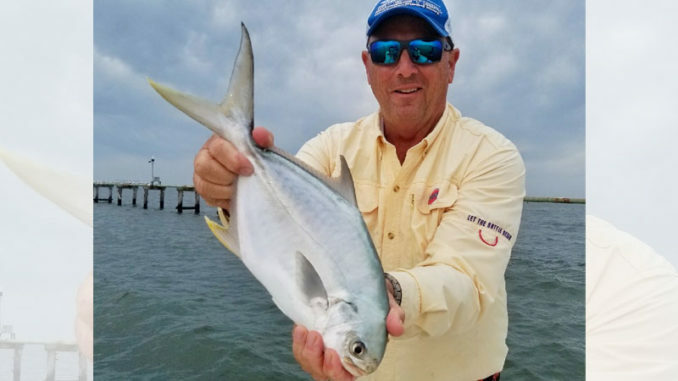 Pellegrin said he caught pompano almost every day on trips out of Cocodrie in early March on a sliding cork rig with live shrimp, but the size of your hook and bait are critical if you hope to fire up some pompano in your broiler back home. “You need some small live shrimp, 80- to 100-count size,” he said. “I use a No. 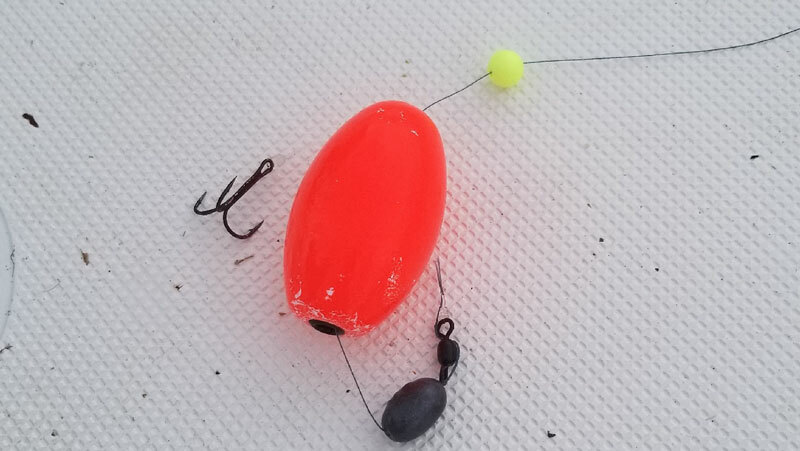 4 treble hook — the same exact setup I use for specks. If you go with a J-hook, try maybe a 1/0. Pellegrin uses a sliding cork rig like this one baited with a live shrimp to catch both pompano and speckled trout. Targeting pompano is difficult, however, because in the spring, they’re typically in the same spots as specks, he said. “The hard thing right now is trying to keep trout off your line. It’s kind of a Catch-22: You’re going fishing and generally want to catch trout and pompano. But if you want a better chance at pompano, you have to keep the trout off your line long enough,” he said. So if your heart is set on pompano, how should you try to catch them? “If I went to go out and target pompano any other time than besides the spawn, I would be in 10 to 25 feet of water just off the beach at any of the wellheads,” Pellegrin said. “They always have them on the sandbars, but they’re hard to target there because it’s such a vast area. They like structure. I’ve caught them out to 40 feet, but they’re not on the bottom, they’re suspended. 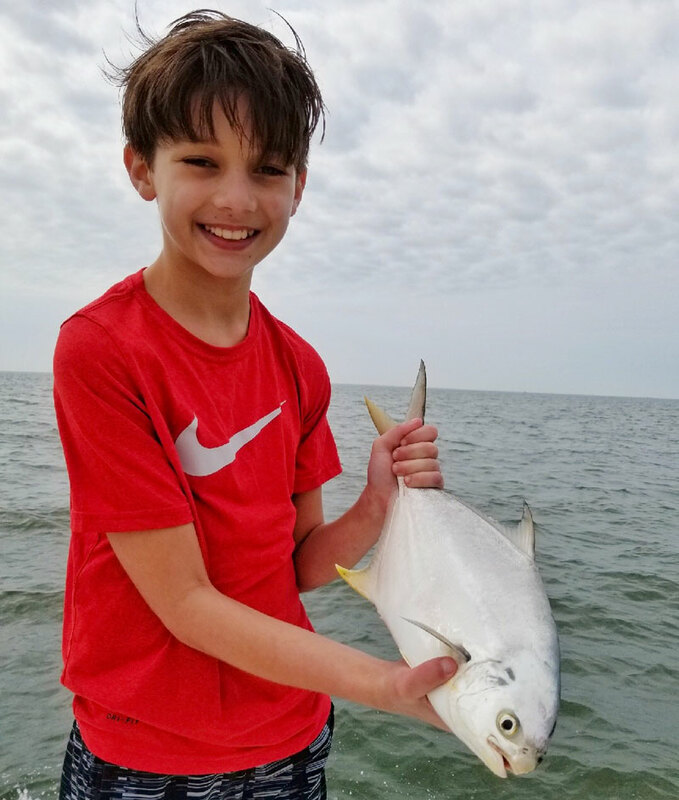 A good-sized pompano in Louisiana waters is typically in the 12- to 14-inch range, probably about 1½ to 2 pounds, Pellegrin said. And if you’re lucky enough to put some pompano on ice, Pellegrin’s culinary advice was simple: Cook it quickly. “It’s great eating, but don’t overcook it because it’s very delicate meat. It’s tender, but firm to the touch,” he said. “When you cook it, it’s similar to flounder — either broiled or pan-fried. Editor’s Note: For more information, contact Capt. Tommy Pellegrin with Custom Charters at 985-851-3304, or visit his website: www.customchartersllc.com.